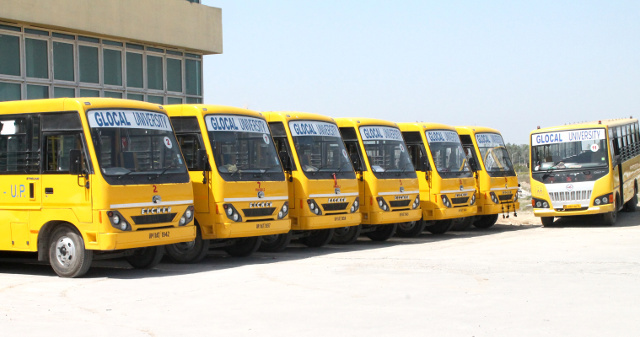 Glocal University provides transport facility to its faculty and staff members on nominal charges through its self- owned comfortable buses. The buses ply on different routes of the Saharanpur to pick and drop the faculty and staff residing outside the campus . The faculty and staff members are spared from the difficulty of commuting to the University by public transport. This also contributes to inculcating an element of punctuality among the members.. Keeping in mind the fact that University is situated in a remote place away from modern amenities,the university provides bus facility to every weakened to its students and staff to visit Dehradun, Saharanpur or Ponta Sahib.